Midstream on the Energy Future: The Passive House Standard | Econsult Solutions, Inc.
“Three days?” I ask because it was difficult to believe what he was suggesting. “Well two days; on the third day, the house overheated in under an hour.” I am standing in the middle of the 13th Annual Passive House Institute United States (PHIUS) conference. 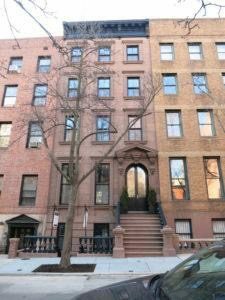 Michael from Ingui-Baxt architects has just explained that his four-story row house in Brooklyn, which had been retrofitted according to the Passive House building standard, needed heat exactly three days during the past winter from a heating system the size of a large window AC unit. New York has approximately 4,000 heating degree days – in a part of the world in which you can wear a winter coat from October until March. Michael successfully had 99% elimination of yearly heating need. This was the Passive House building standard in action, a kind of through-the-looking-glass moment. 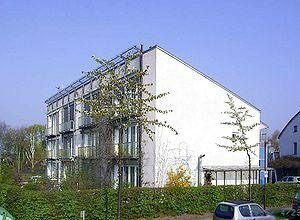 The Passive House standard originates with a conversation that took place in 1988 when an engineer, Bo Adamson of Lund University, Sweden and a physicist, Wolfgang Feist of the Institute for Housing and the Environment in Darmstadt, Germany, asked: “How do we eliminate the heating problem?” In the context of carbon emissions, where a third of the global fuel use is for heating buildings and for anyone worried about climate change or fuel costs, this may have been a simple but not trivial question. From this bloomed PassivHaus, the European progenitor of PHIUS. Over the ensuing decades, their research and development work yielded the Passivhaus performance standard, a design software package and over 40,000 certified residential and commercial buildings worldwide, all meeting the base criteria: use only 10% of the usual heating and cooling energy, 20% of the usual total energy use (heating, cooling, plugged in objects such as lights, refrigerators, and computers), all while meeting indoor air quality standards. 30 years later, there is a full-blown movement, anchored by conferences around the world. The conference I attended, at the Seaport in Boston and hosted by PHIUS, is a mix of architects, building consultants, industry sales reps, low income housing experts, city planners, engineers, students, and everyone in between from a variety of cities and nations. The conference topics were also myriad: developers of Puerto Madero in Cartegena, Colombia describing a multi-phase net-zero resort development, Tim McDonald presenting market-rate Passive House rowhomes in Philadelphia, public-private partnerships for retiree, low income housing in Minnesota, and a Canadian manufacturer presenting step-by-step demonstration of whole building wrapping to meet the Passive House standards, to name a few. It was hotbed of activity for the future of design and construction, a GenCon for building science nerds. So where does this cutting edge building science really take us? The key to the passive house standard and certification is its focus: measure and meet the performance goal. That’s it. The certification encourages industry creativity and evolution: you can build the building out of anything you like and in any way you like, so long as it meets the heating, cooling, equipment loads, and indoor air minimum performance requirements. In practice, designers explore their options by creating a model of the building within the Passive House software package. This software package spits out numbers that tell you how the building is expected to perform. By changing the elements of the model, the designers can test designs in real time. Engaging the standard this way compresses the design time and allows for rapid, low cost exploration of design options and price optimization. It changes the game of sustainability by simultaneously opening the field and upping the ante. All while holding it accountable to something measurable: energy use. In practice, we are finding that the Passive House standard largely solves the load challenge – it is the demand-side solution, par excellence. Holding operating costs to one-tenth the norm certainly provides a utility hedge. It also reduces equipment costs and maintenance proportionately, downsizing systems to the point of plug-and-play. But that is only half of the equation. What about energy supply and the other half of the built environment? Solar, wind, and storage have made significant strides, and appear to be the anchor of the new energy economy. Do they fit together in lock step, and if so, how? The critical component is the demand reduction. By starting with a manageably low energy demand in a building, the opportunity for practical, load-matched, on-site energy generation appears. This combination of low demand and adequate electricity generation can yield low or no net draw on the grid, a “net zero” building. Support for net zero building – a formal definition whereby a building or site generates the energy it uses – is widespread, including financing and public-private partnerships running out of the United States Department of Energy. 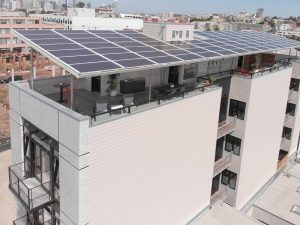 A cutting edge example of net zero energy building (NZEB) is the combination of solar and Passive House certification in the condominium Sol-Lux Alpha, also reviewed at the conference: billed as “carbon neutral”, it sports a grid-connected solar power system supplying condos and their battery banks in the middle of the Mission District in San Francisco. Expected to be net-positive, it will sell energy from its “nano-grid” back to the main grid and function, in essence, as a micro power station. This vision of “buildings as power stations” fits within the larger future cast for world energy markets. Over the next 30 years, the prediction is 50% renewables worldwide, with $8.4 trillion going into solar and wind alone. With a predicted 70%+ drop in solar costs from today to 2050, solar is beginning to look ubiquitous at $0.60 per watt installed. Approaches that combined reduced demand with essentially free supply promises to be the potent combination everyone has been searching for; so much so that the question may be how quickly will net zero or its equivalent become the building code standard, rather than if or how it will remain part of the energy efficiency niche in the building industry. Looking more locally, with less than one sixth of Pennsylvania’s energy supply composed of wind and solar, the market is wide open for displacement. Applying a “50% renewables by 2050” metric, the result could be upwards of 15 million megawatt-hours, or around $1.5 billion worth of displaced generation income from the fossil fuel market per year, in 2018 dollars. That’s also nearly $20 billion of solar infrastructure investment through the same period. That ignores building retrofits to the Passive House or similar standard, which come in at a 2-10% premium on conventional rehab. With $8.1 billion in statewide construction spending in 2016, that could add upwards of $800 million in construction industry spending in a good year. Ara Hovnanian once said “(housing) construction is 200 years of tradition unhampered by progress.” For Passive House and net zero, these are early days. However, the realities of the global marketplace, combined with the shifts in demographics, population densities, and resource access, it seems ever more likely that energy demand will drive changes in the built space unlike in centuries past. As such, it seems worth our while to take a long and serious look at where the green economy is going to move the cheese. Visit ESI’s Solutions For Energy Sector to learn more about our capabilities within the energy industry by clicking here. ESI also helps utility companies make their case about the economic impacts of their demand-side programs, find out more by clicking here. 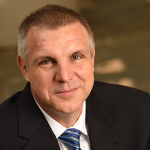 Brian Uher is a senior advisor at ESI and is currently a partner and Chief Technology Officer at Energy Conversion Research in Washington, DC. He also maintains CORE/FORM Design Consulting and is a founder and former Director of Amicus Consulting Services in Kensington, MD. His work has focused on demand-side efficiency in the building industry and he has developed methods for incorporating return-on-investment with energy modeling and life cycle analysis to identify and quantify best in class sustainable building techniques. Employment in Construction: Where are the Skilled Workers? A Conversation on Design Thinking City Governance – What’s Design Got To Do With It?